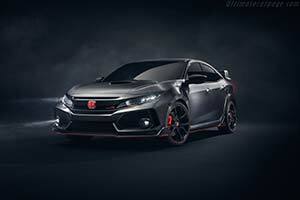 The new Honda Civic Type R Prototype has been revealed at the 2016 Mondial de L'Automobile in Paris, offering an insight into the styling of the next-generation Civic Type R which will be officially unveiled in 2017. Honda's famous red 'H' badge - which adorns all Type R models - sits above a new air vent at the nose of the car. There is also a new intake on the bonnet, with an air scoop sited centrally in a trapezoidal recess. Smoked lenses for the LED headlights, indicators and side repeaters reflect the Type R Prototype's more aggressive character. The next-generation Civic Type R was engineered within the same development programme as the other members of the Civic family, and will be officially unveiled in production form next year. It will be produced at Honda of the UK Manufacturing (HUM) in Swindon - the global manufacturing hub for the five-door hatchback, with sales expected to begin in Europe during the second half of 2017. The Type R will be exported to markets around the world, including the US - which will mark the first time that any Honda-badged Type R has been officially sold in North America.